In addition, Group settings related to the features are covered and recommended best practices for Groups will be discussed. It should be noted that this discussion is centered on the web portal interface for Groups and their features. There are desktop clients and mobile apps for many of these features, but those will not be discussed here. Below is a video of the author presenting on the topics of Groups and Planner at the 2017 Conference on Higher Education Computing in Kansas (CHECK). Office 365 Groups have email functions which are designed to help with email communication and organization of email content to increase efficiency of Group related email. Groups have an enhanced distribution list function upon their creation. By creating a Group and adding members to it, you will have a distribution list for the members that does not require any additional set up. This is “enhanced” because a distribution list is a way to email a Group; however, they often cannot be used for interactive emailing. The list from the Group can be used in such a way and is not limited to one-direction emailing. Group members can reply back to the message, and email can be sent using the email address generated for the Group. Finding the email address for your Group is not hard, but not intuitive. The easy way to find your address from within the Group is to go to the Conversations section of your Group. The Group sends out an invitation email to all Group members when they are added, and it retains a copy of the message in the Group Conversations. If you hover over the sender (your Group’s name), a popup will appear that has the Group email address. If you need to email the Group from outside of the Group, you can find the address in the same manner you would find the address for a person. Begin typing the name of the Group into the "To" field, and the name will either auto-populate, or you can click the search feature. Group addresses are stored in your organization's Global Address List, so they are searchable like for typical email users. Figure 2: Searching for Group Name when Emailing. Groups display email in conversations. This means that when people reply to a message sent to the Group the reply will attach to the original message. This maintains email messages on the same topic grouped together. You can set to have messages sent to the Group also sent to individual Group member’s inboxes. 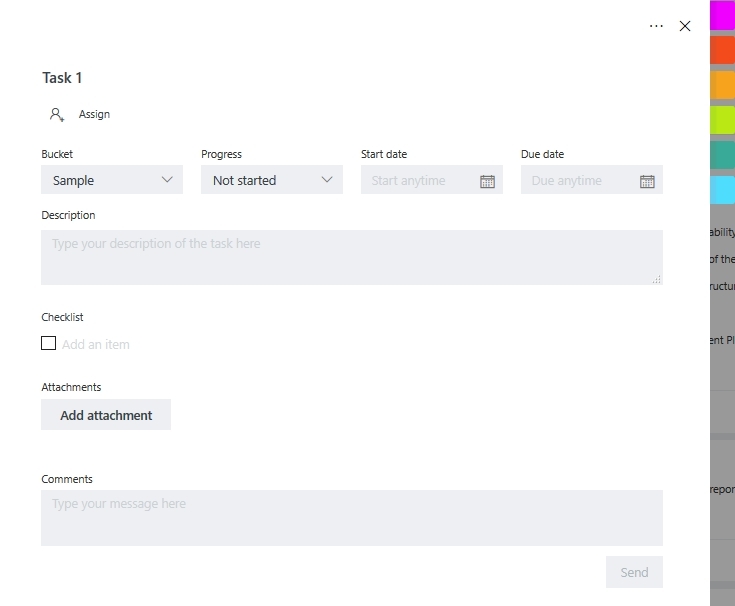 For messages delivered to individual inboxes is that they will either use conversation view or be shown as individual messages depending on the user’s setting for the individual inbox. So if the user’s inbox is not set for conversation view messages from the Group will not show as conversations even though that is format for the Group inbox. Owners of the Group can set at the group level whether to deliver messages to individual inboxes or not. Group members can set whether or not to receive Group email to their individual inbox. If a Group is delivering to inboxes, the member can override the group setting if they do not want to receive the message in their own inbox or vice versa. A Group owner can adjust this setting by going into the Group and clicking the Group avatar. Note the avatar will appear as initials for the Group if a photo was not selected for the avatar. After clicking the avatar a setting pane will open on the right side of the screen. This pane allows you to change settings for the Group. To have messages delivered to individual inboxes check Send all group conversations and events to member’s inboxes and then click Save. In regard to having Group messages delivered to inboxes, if a person sends the message to the Group from Conversations, they will not receive the message to their own inbox even if they have messages set to be delivered there. In our organization, this feature has caused some confusion, with cases of the message being sent multiple times to the Group because the sender thought it had not been delivered. Deleting email in Groups has some unexpected features. First, Group email can only be deleted by an owner of the Group. Non-owner members are not able to delete messages from the Group Conversations. If a conversation is deleted, it will no longer show in the Group Conversation; however, if the message was delivered to individual inboxes the deleted message will remain in those inboxes. Second, you can only delete a conversation. This means that you cannot delete a single message. If you have a conversation that has several messages in it, all of the messages will be deleted. Groups have built-in Calendar functions which can aid with scheduling events for Group members. The Calendar experience is another area that is a bit different from the normal experience of your personal calendars. The first quirk is that you do not view the Group calendar from within the Group. When you click Calendar in the Group, you are sent to your personal calendars with the Group calendar showing up as a new available calendar. 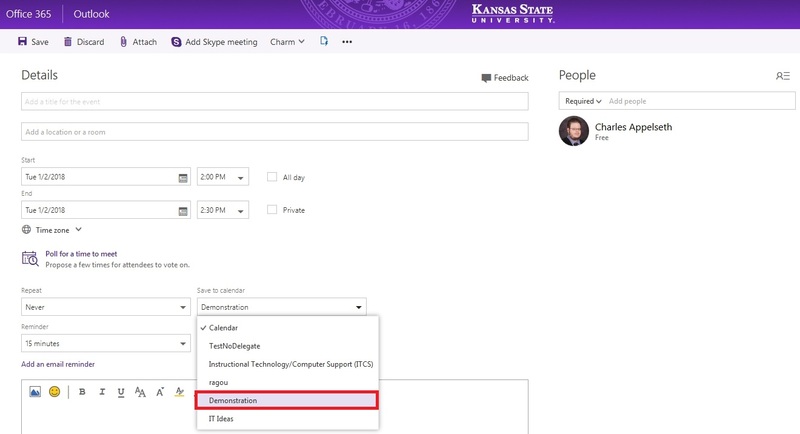 The Group calendar will now show as an available Calendar under your Office 365 Calendar web portal interface. Figure 6: Group Calendar Now Available. You create a Calendar event in the same fashion as any other Calendar event. Click new, and then fill in the information such as title and event. You will need to make sure to select the Group calendar from the Save to calendar option or your event ends up on your personal calendar. After you have selected the Group Calendar, you will notice a change under the people section. The Group name will show under people and you will have a check box to select if you want to send an invitation to your group members. This allows you to invite all the group members without entering them in manually as attendees. By unchecking the box, you can place the event on the Group calendar without sending invitations which may be beneficial due to what you are putting on the Calendar. For example, if you group is composed of professors and you are marking the beginning of the new semester you would not need to invite people and receive acceptance or declinations from them for an event of that type. Also, you can help diminish personal calendar clutter for your Group members by opting to not send the invite to them. However, I would say to be cautious when choosing to not send invitations. If it is an important meeting and your group members are not use to checking the Group Calendar this could lead to people missing the meeting. The Group will list a status for availability. In the picture below the Demonstration Group is showing “Away” as a status. The availability feature is limited because it does not say who in the Group is unavailable. It can be a nice scheduling feature though because if the Group shows “Free” that means that everyone in the group is available if they have been keeping there personal calendars up to date. You are still able to add people that are not in the Group as attendees for the event. This is a nice feature for situations such as inviting guest speakers or outside consultants to your Group event. The Group Notebook is a versatile tool that can facilitate collaboration in several different ways and can be used for some other benefits as well. Earlier we discussed the Group email features to help manage email more efficiently. With the Notebook, you can minimize the overall amount of email to personal inboxes and Group conversations. When people have meetings ideally the meeting is beneficial and one technique frequently used is to have meeting agendas and develop action items in those meetings. How do they manage those typically? In most cases this generates two different email messages that are sent out to people in the group or committee. Over time those email messages add up particularly if people are members of multiple groups or committees. A secondary problem is needing to go back at a later time to find the particular email message you are interested in reviewing. So how can Groups and the Notebook help with this? 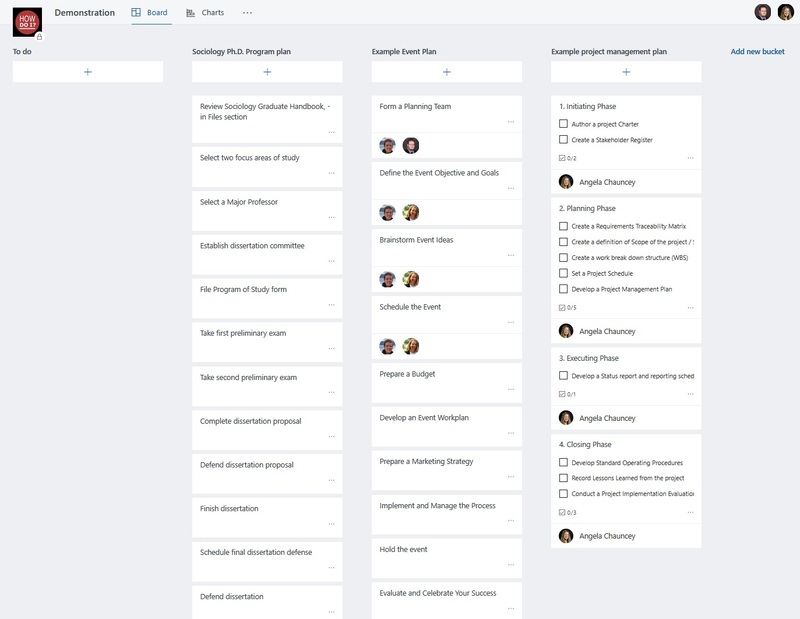 You can leverage the Group Notebook by adding a section called “Meetings.” Under this section of the Notebook you can create pages for the agendas and action items of each individual meeting. When using this technique myself I will often use the meeting date and either agenda or action items for the title of the corresponding meeting. So examples would be 1/2/2018 Agenda and 1/2/2018 Action Items. Using the described technique helps with two problems. There would be no email generated and finding the agenda or action items from a particular meeting would be easier than searching through your email inbox due to all of the meeting notes being in one location. While on the subject of meetings, the Notebook can be used to minimize the number of meetings held. If you find yourself in meetings that are primarily just giving status updates, the question arises: do we need to meet? As an alternative to physical or video call meetings for cases such as those you could set up sections and pages in a Group Notebook for update logs. The updates are conveyed to the group members without the need for a physical meeting. The challenge is to create a culture for your group to start posting their updates to the log and also remembering to check the log for updates. Another area that the Notebook can be a powerful tool for is training or instruction. You can easily create rich content in the pages of the Notebook. 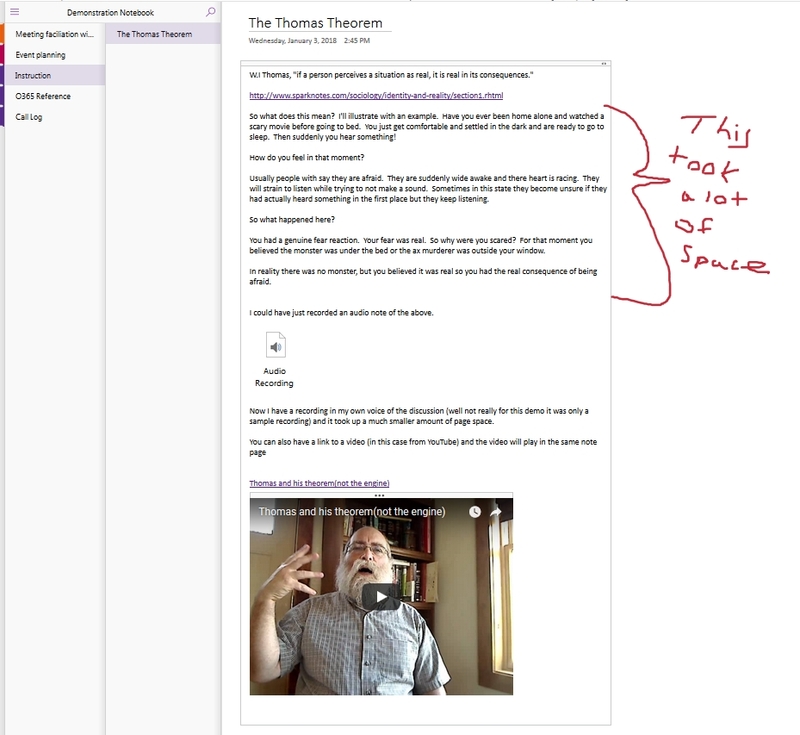 In addition to text, you can embed content such as pictures and videos and even record audio notes into the page. It has a built-in drawing tool, so you have functionality similar to a whiteboard. One "use case" would be an instructor providing tutoring or class study sessions. I compare using these tools to providing a class lecture. In a lecture, an instructor will have some type of visual aid to identify discipline-specific concepts. This could be a simple tool like a chalk or whiteboard, using an overhead projector, or a PowerPoint presentation. Often what students see from the visual aid is the concept and its definition. In other words, not anything more than what they could get from their textbook. The auditory part of the lecture is more important. While speaking to the class, the instructor tells what this concept means in common (non-technical or discipline specific) terms and then usually related this to real life. So they are making the concept relatable for the students. How often have you as an instructor or how often have you heard as a student, “Don’t focus on writing everything down from the PowerPoint; take notes on what is being said?” This is something most of us have heard multiple times throughout our educational endeavors. A frequent challenge for online instruction is how to incorporate lecture materials. You can use the Notebook tools to simulate the lecture experience so it can be an effective way to reach students or coworkers in training or tutoring sessions. Present the textbook definition of the concept similar to what you would have on the PowerPoint, and then record an audio note below it where you discuss the concept. You also could put a link to an online video that discusses the concept into the page of the Notebook. Video links are particularly effective because the Notebook will allow to play the video on the same page, so your students are not kicked out to a website to view the content and then need to figure out how to get back to the notes. The image below shows those features typical in a Notebook page. It gives the definition, a break-down of what the term means using an example, shows what an embedded audio recording looks like, and also shows how a link to an online video will appear on a Notebook page. In the example image above, the red “handwriting” on the right side was done with the drawing tool. If you have a touch screen computer, or a stylus (pen) and tablet, the quality of the drawings and/or writing would potentially be better because the example was developed up using a mouse. In addition to creating diagrams with the tool, you can use it to make notes, reminiscent of the red pen days to mark-up contributions to the Notebook by your students. The Notebook serves as a discussion and feedback board. Groups have an area where files can be stored, and in the case of Word, Excel, and PowerPoint, they can be edited live from that location. There are a few benefits from the Files feature. First, it gives your Group members a place to store all of the documents related to what the Group is working which helps cut down on losing time trying to locate files or make sure you are working with the most current version of the file. A second benefit can be more email minimization. By keeping the files in this location which is accessible to all of the Group members there is no need to send these files out to people via email. Lastly the ability to edit Word, Excel, and PowerPoint documents directly from the Group Files site is handy if a Group member is away from their own computer. Even if the computer they are working from does not have Microsoft Office installed on it, they can still edit and even create similar files through the online versions of those applications accessible through the Group. It is beneficial to know there are two different ways to view your Group’s files. The plain view when you first open files is the default; however it does not always show all of your files and if you had used folders to organize the files they are missing. So this view can look like a haphazard arrangement of your files and you may also have appeared to lose some files. The second file view can be found by using the Browse library feature found at the top right of the default file view. This will open a second window with the new file view which should contain all of your folders and files. I recommend working from this view because it is much easier to organize and find your files. In the example below you can see that there were two folders we did not see in the default view above. The graduate handbook from above is actually located in the PhD program folder. 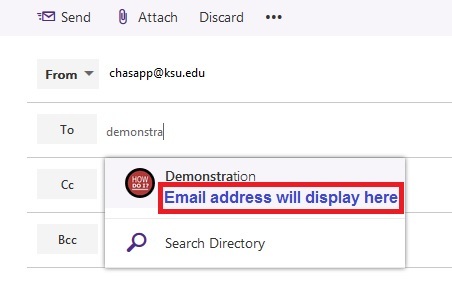 The email attachment folder is a default folder where files attached to email messages to the Group will be housed for easy access. In this example we do not have any files of that type. From this view, you can add more columns to display different statuses of your files by clicking the + to the right of the file column headings. One that is particularly valuable for collaboration is a yes/no column. In this case the yes/no column can be used to indicate if the file is in its final draft or if it still needs work. This small addition can make it much easier for your collaborators to know if the file still needs editing or not. Once you have selected Yes/No as your column type you will be asked to fill out some simple information such as the column title, a description of what it is for, and whether the default value is yes or no. For this example the default was set to no to indicate the file is not complete. 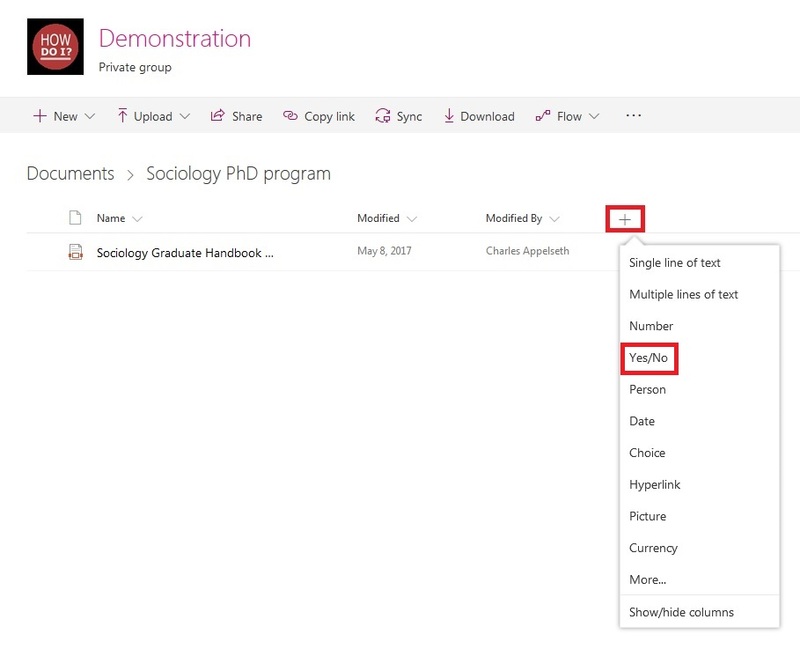 After completing the column creation task and saving a new column will display for your files. This new column only shows in the Browse library view. When you create additional columns, they are treated as properties of the files. To change the status, you need to right-click on the file and select More and then click Properties. Figure 14: Right-click on File to Open Drop Down that Contains File Properties. After arriving in the Properties section, you will see a section for the column you added. In our example, the column is called Document Complete, and it was yes/no, so if you click on it, you will get a slider to change the value from no to yes. Also, the description you wrote for the column will display, so having a simple but detailed description will help your Group members when they are deciding whether or not to change a column status. Once the status is changed, the column section for the file will also change to reflect the new status. Planner is a light-weight work planning tool that can be used in many ways. There are three core components to use when developing a work plan. The first is the “Bucket.” You can think of the bucket as the plan or project itself. It is the place where the project tasks will be contained. The second component set are Tasks. A task is what it sounds like; it is an action that needs to be completed for the plan to be successful. The third core component is optional and known as a task checklist. You can create a task without using a checklist, but if your task contains multiple parts, a checklist is a good way to identify the parts and the order they need to be completed. Before talking about some use cases for higher education, I am going to show the Planner from my Demonstration Group. This will show what plans look like when they are put together. When opening Planner for the first time, all that will show is an empty To do bucket. By being confronted by an empty page people may be afraid to use the tool thinking that it will be complicated to figure out. 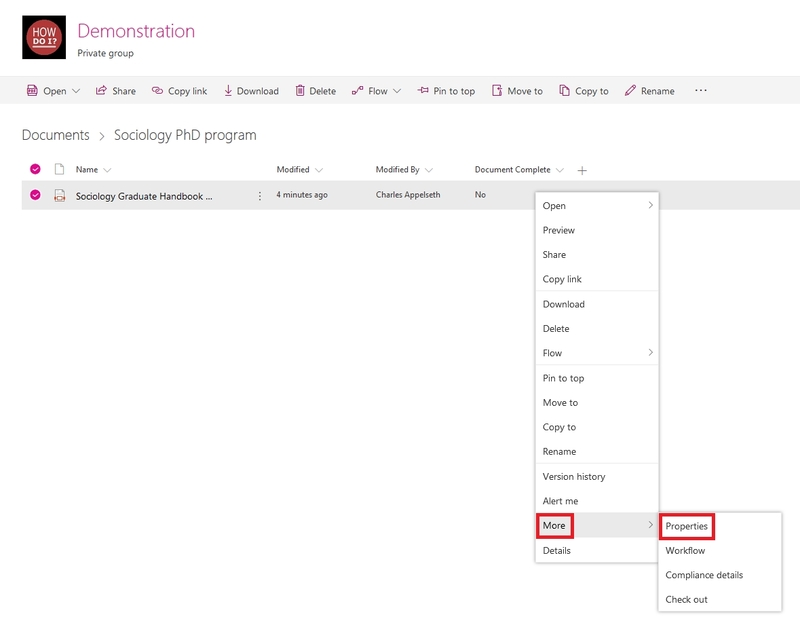 In the Demonstration Planner, you will see the default To do bucket along with three more buckets: Sociology Ph.D. Program plan, Example Event Plan, and Example project management plan. Each of those buckets look just a little bit different and those differences will be discussed. The basic things to think about when using Planner are: what, who, and when? What are we doing? Who is the person or people responsible for doing it? When does it need to be done? What are some ways to use Planner? Any type of event planning could benefit from a planner if multiple people are involved. If your college or university hosts “open house” events your department could use Planner to plan the exhibit your department will be doing for the open house. Similarly if your department is hosting a conference, Planner could be used to organize and set a timeline for the conference. Academic plans are another area when Planner may be beneficial for the task. In the picture above there is an example of a Ph.D. program plan. In this case it would be a professor using a group to work with one of the students they are advising. I used this example in my Demonstration Group because it was something I went through myself. When I was in my graduate program I knew roughly what I needed to do while working towards the degree. However, I frequently found myself confused on when I needed to be working on what. For example, I had begun writing chapters for my dissertation when I should have been studying for a preliminary exam. This caused a delay in taking the exam and delayed my overall progress. Having a plan such as the one above would have helped me keep on track. While a Ph.D. plan is large, smaller types of academic plans can be used as well. Groups are designed around collaboration; however, you can have a group of one. Why would you do that? As a professor or an instructor, have you ever found yourself thinking "I have so much going on this semester and I am having a hard time keeping track of all of it"? If you have, a Planner may be a tool for you. You could create buckets for the courses you are teaching with tasks for important milestones such as lecture topics, assignments, term papers, and exams. You can create buckets for your personal work such as research you are conducting, articles you are writing, or grants you are submitting. Similarly, a student or graduate student could use a plan to organize their work for the semester. Again having buckets for the classes they are taking, ones they are teaching (graduate student), and for research projects. One thing to be aware of with Planner though is that when you assign a task to a person or people and have a due date assigned to it; that date will not be indicated on the person’s primary Outlook calendar. Having the task added to a personal calendar is not a current feature. This means people in your Group will need to check Planner to see the due dates for the tasks assigned to them. Other examples of the Planner are if office staff are needing to coordinate with faculty and other staff to carry out a departmental equipment inventory. Members of facilities may opt to use it to carry out work space remodeling tasks to organize things such as when the new lights will be installed, when painting will occur, and when new carpet is installed. In short, whenever you need to know what needs to be completed, who will be doing it, and when it needs to be done you can use Planner. To begin, you will click Add new bucket, and type in the title. You can change the title later. After your bucket has been created, you will see a box that has a + sign. The + button is what you will use to create tasks. The initial task popup is very basic. It only has a place to type the title, which is the only required piece to create the task, setting a due date and assigning it to a person or people. 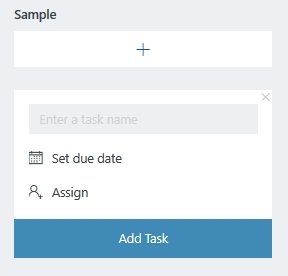 After naming your task, selecting a due date, and assigning the task (if you wish), click Add Task, and your new Task will show up under your bucket. The task creation box will remain, allowing you to add more tasks. If you close it and need to add more tasks later, click the + button again to reopen it. After your task has been created, click it to get a new task box that allows you to add more content to the task. This new box is where you can create checklists, set the status of the task, and add a color label. You can add attachments to the task or add comments. In my opinion, these two options can cause some clumsy results, so here are recommendations that when using Planner. For attachments I recommend the option in the task only be used if you have a file such as a Word document that is advising how to carry out the task. If however, you have a file that the group needs to review or work on together, I would recommend using the Files section of the Group instead. Create a folder with the bucket name in Files with another folder under it that has the name of the task and have the file or files related to the task in that location. Use the Comments section of the task to indicate the file or files have been created and their location. Since tasks can be assigned to individuals or a smaller subset of the group not all group members may know where to look in the bucket to find the particular file that is being worked on. This also helps to keep the task files in the same location as the other group files. For Comments, it appears this feature was designed only for brief comments. So if you have a lot of comments entered into this section in the task, the readability starts diminishing. I recommend using the Notebook to have more robust comment notes. In that case you would create a Notebook section that has the name of the bucket and a page or pages for the notes you wish to enter. This can help keep your task notes more organized and easier to read. A final note on Comments is that depending on the Group email settings you are using whenever someone enters a Comment in the task it can be emailed out to the entire group. This can generate a lot of email very fast if a lot of notes are being recorded in the Task. Since I favor email reduction, this feature is a bit of a turn off for me, and I preferto use the Notebook to augment the Task without generating extra email messages. To create a checklist for your task go to the checklist area and type in your item then click enter. The items will appear as your first checklist component and you will now have an option to display the checklist on the card. The card it is referring to is the task card in your bucket. By having the option turned on you will see your checklist items on the task when viewing it from your primary Planner view. When we first began the discussion on Planner, an image was shared that showed example plans. Note the plans looked different from one another. The one that looked the most different was the example project management plan. In that case, the difference was that the tasks were using checklists and the Show on card setting was enabled. If you are using task checklists, it is a matter of preference if you want to use Show on card or not. It is a good visual indicator of the checklist progress. Once the checklist item is checked, it will disappear from the list similar to how a completed task will disappear from the bucket. Both of these can still be viewed by clicking on Show completed either in the task for the checklist or in the bucket for tasks. Also, you can revert a checklist item or task back to non-completed form by viewing the completed items in the event if one was marked completed prematurely. For checklist items it should be noted if the text is too long it will be truncated on the card. So if you have a lot of long items you may choose to not show them on the card because you will still need to open the task to read them. Another example of difference in the example above are the little pictures and names at the bottom of the task card. This is how Planner indicates if someone is assigned to the task or not. In this example photos of the people are shown. This is because they have selected a photo to use with their Office 365 account. In the case where someone has not selected a photo or if your organization does not allow photos Office 365 uses an avatar that has the person’s initials. in the case of a single person being assigned the task, it is also displaying their name. If you have multiple people assigned to the task only the avatar will display. Notice from the example image above that the titles of the tasks are numbered. I recommend this feature if you are working with multiple tasks in your buckets. Tasks can be moved either up or down in a bucket and can be moved from one bucket to another. This is a nice feature because it allows you to freely rearrange tasks when you are deciding what would be the best order for them or in the event you miss a task and add it to the bucket later. While working up my Demonstration Group, this is something I was doing. I noticed, particularly when I was using the touchpad on my laptop, on occasion, I accidentally dragged and dropped a task to the wrong place and did not immediately notice that I had done that. After you have determined the order for your tasks, you may want to go back and modify the task titles to list their order number. This way as people in your group are working with the tasks in the bucket it will be easy to put them back in the correct order if someone accidentally moved one. Wait until your task list is mostly complete to number them. If you start numbering at the beginning, it could be frustrating to keep editing the numbers if you find you had missing tasks for the plan. Another suggested best practice comes with the assigning of people to tasks. Originally Planner only allowed a single person to be assigned to a task. This was a frustrating feature for some users who found that they had cases were more than one person were working on the Task. After receiving this feedback Microsoft changed the feature to allow multiple people to a Task. Why did they originally have it set to where only one person could be assigned? My guess comes from group dynamics. Many of us have heard and may have even observed that when working with a large group of people it can be more difficult to arrive at a decision and/or work to take longer to be accomplished. When you have many people working on one thing it can become confusing for them to know who is doing what. This confusion can lead to nobody doing anything. I can see this as a potential problem when it comes to task completion. So I would recommend have your tasks broken down into the simplest part they can be and only assign them to one person when it is possible. There may be times when you need to have more than one person assigned but keep in mind that if the task is complicated and there are many people attempting to work on it the task may take longer to complete. Keep your tasks and assignments simple when you can. There are some limitations of Planner. You cannot copy a bucket in Planner. If you have a bucket setup for something you frequently do, you cannot reuse the bucket. For example, one of the plans I had in my Demonstration Group was a Sociology Ph.D. Program plan. If I was a professor this is something I may use multiple times if I am working with multiple students going through a Ph.D. program. It would be nice if I could set up the program plan bucket and use it as a template that I could reuse for multiple students. You are able to copy Tasks though so while a little more tedious you could replicate your bucket be copying each task in it and moving them to a new bucket. This leads to another limitation though. The next limitation is that you cannot export data out of Planner. In the case of the Ph.D. program example you most likely would not have all of your students in the same Group to protect confidential materials. So if you did reconstruct the bucket using the task copy method you would not be able to move that bucket or even a copied task to a different Group. It may be desirable to export a bucket to a Word or .pdf document, so that it could be attached to a report but that also cannot be done at this time. So these are some important things to be aware of when using Planner. Teams was recently released at Kansas State University so I do not have as much to say in this section as the previous sections but what are Teams? Teams is another collaborative platform with some of the features of Groups, but is built around a chat platform as its organizing principle. When would I want to use a Team instead of using a Group? A Team may be desired if the people in your group want or need to be communicating with each other frequently or will be working on things in real time despite being physically located in different places. 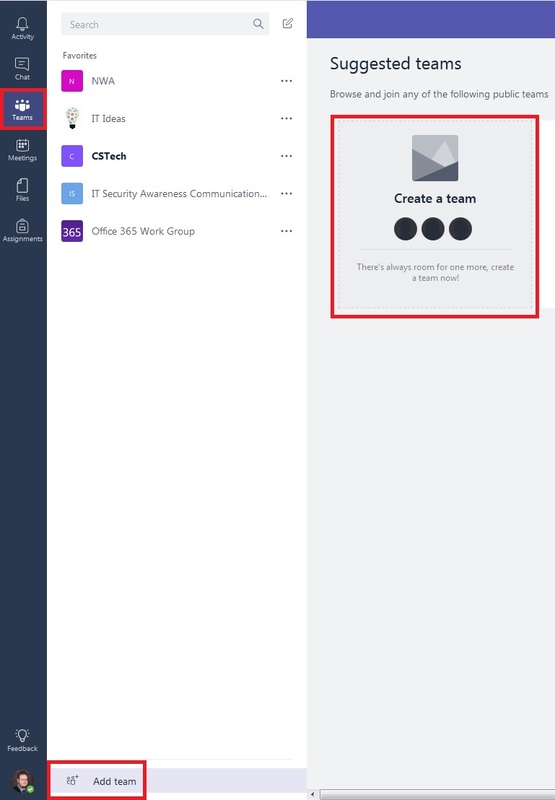 While Teams look and feel distinct from Groups, you can add a Team to an existing group, but the integration is not as seamless as when Microsoft released Planner. For instance, you cannot get into the Team site from within the Group site directly and vice versa. There will be some syncing between the Files section of the Team and of the Group but at the time of this review the syncing does not appear to be perfect meaning that somethings a particular file only seamed accessible from one of the Files locations. When you create a Team, you have to select a type which will influence the Team Notebook. The Team Notebook will come with some predefined sections. If you are adding a Team to an existing group it can be a little messy when those Notebooks sync up. The predefined sections and pages of the Team Notebook will merge with your Group Notebook and may not be in a particular order so the flow of your Group Notebook can be disrupted. However, like any other pages or sections of the Notebook, these can be moved or deleted. Adding a Team to an existing Group is a little tricky. To start, go to a different place from your Group site. 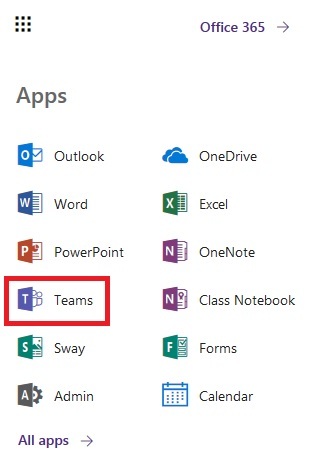 Go to your app launcher from Office 365 and Select Teams. If it is not showing, click All apps first. This will take you to the Teams site. This is the first place where you begin to realize the Teams' experience is not as well integrated as the features from Groups. It is not as easy to get back to your Office 365 portal from Teams if you have been navigating around in Teams for a while. Eventually with enough clicks of your browser’s back button you will get there, but this can be a frustrating experience so you may want to open a separate browser window to keep the portal displaying while you are working with Teams. Once you are inside of Teams select the Teams icon in the left navigation pane and then select Add team from the bottom of the pane (immediately to the right). Next you will be given a choice of four types of Teams: Classes, PLCs (professional learning communities), Staff Members, and Anyone. The type of Team you select will influence your Team Notebook in terms of predefined sections and pages. After making your choice, you will receive a popup box to name the Team, add a description and select the privacy. If you are adding to an existing Office 365 Group, do not modify any of those settings. 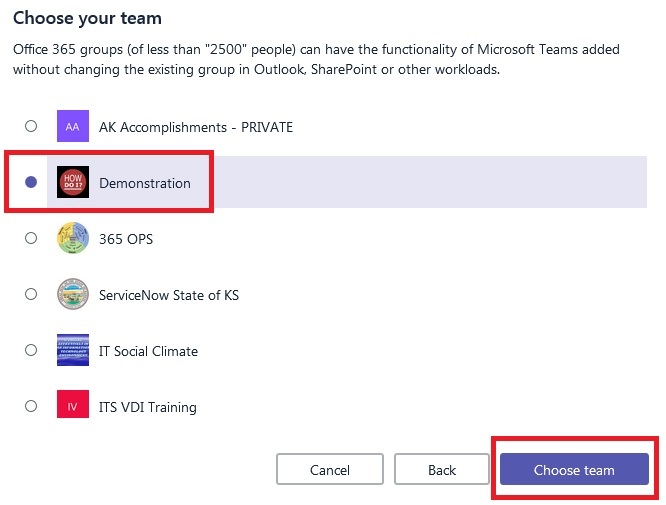 Click the line: Create a Team from an existing Office 365 Group. Next you will want to look through your list of available groups, and select the one you want to create a Team from. In this example, I used the Demonstration Group. Once you have selected the Group, click Choose team. After a few moments, your Team will be created. Once you have created a Team for a Group, plan on keeping it. Once the Group and the Team are associated, if you select to delete the Team, you will get a warning notifying you that all of the chats and channels of the Team will be deleted. However, it will also delete your Group as well. I did that for my Demonstration Group while writing this article and was surprised that my Group was now gone. You can recover a deleted Group for up to 30 days, but this will require help from an Office 365 Administrator. Deleted Groups cannot be recovered by owners or other members of the Group. Group Owners have some additional power that normal Group members do not. Earlier I mentioned that only Group Owners can delete email conversations. They are also the only individuals who can modify Group settings and delete the Group when its purposes have been fulfilled. They also have the power to make other Group members Owners. A recommended best practice is to have more than one Owner. With a Group you can have up to 10 people with the “owner” status. An Owner can go to the members section of the Group and however over a person and they will see the three dots to indicate options are available. Clicking on the dots will have options to promote the person to an Owner or remove the Owner status if that member is currently an Owner. They can remove the individual from the Group. In addition to having help for Group management having additional owners will insure that the Group will persist if one of the Owners leaves the organization. If a Group only has one Owner and that person leaves the other Group members will lose access to the group, depending on your organization's deprovisioning process. If a Group was created to fulfill a certain purpose and that purpose has been fulfilled, the best practice would be to archive any materials, then have an Owner delete the Group. While the parameters of an Office 365 tenant are quite large, they are not limitless. 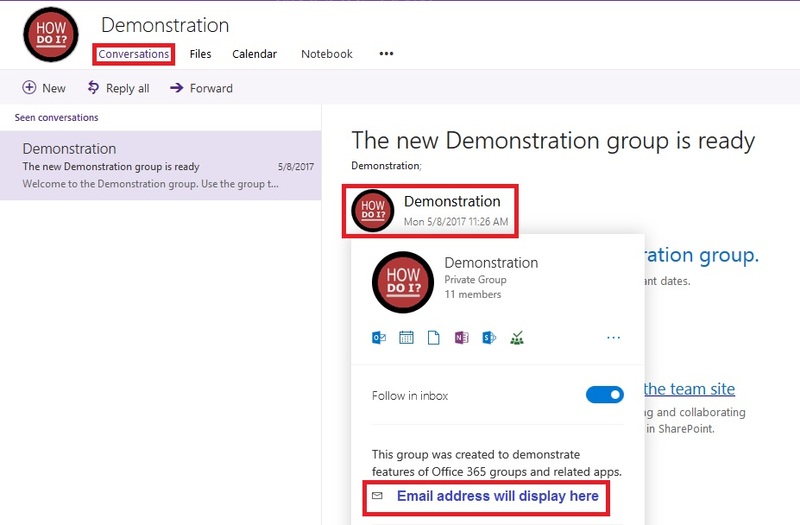 Your IT Administrators will thank you for freeing up Office 365 tenant resources by removing Groups when finished. Group owners can go to the Group avatar to access the Group settings. At the bottom is the option to delete the Group. Recall from my mistake that if a Group is deleted, it can only be recovered for up to 30 days and will require help from one of your Office 365 Administrators. Be sure you are done with the Group before deleting it. When creating a Group, you may choose to make it public (open to everyone in your organization) or make it private (only available to members you add to the Group). An Owner can change this status at any time in the Group settings section. If your Group is public, anyone in the organization can find it and join without any special action. This type of Group would be suited for any type of group that has an open stance on joining such as a club or outreach Group. If your Group is private, it can still be found by anyone in the organization, but they would have to request to join it, and only an owner can allow or deny them access. The request would come in the form of an email to the Owners of the Group with the option to allow or deny the person. A recommended practice would be to be mindful of the titles and descriptions you choose for your Groups. If you have a public Group, you would want at title that hooks perspective members and a description that adequately informs them about the purpose of the Group. On the other hand, even if you are creating a Group only for yourself you will want to have an appropriate title because even though it is private other people could still see it. Below is an image of the Group settings as a reminder of where to find and change the settings discussed above with the exception of adding more Owners to the Group. This article is not an exhaustive list of all the features available in Office 365 Groups particularly since Microsoft is continuing to develop and release features all the time. Hopefully it helps spark some ideas for you on how to collaborate more efficiently, better manage and reduce the number of email messages, and spend less time in meetings. I encourage you to go into Groups and play around to figure out what works best for you if your organization is using Office 365 and has these features enabled. Charles Appelseth is the Information Technology Coordinator in Client Services at iTAC, at Kansas State University. He has been affiliated in one way or another with K-State since 1994. Appelseth started there as a student and worked his way up through graduate school receiving a Master’s in Sociology, Graduate Certificate in Women’s Studies, and a Bachelor’s in Psychology. He was on his way to receiving a Ph.D. in Sociology but decided on a career change after he had received Ph.D. candidacy and moved into the field of information technology. 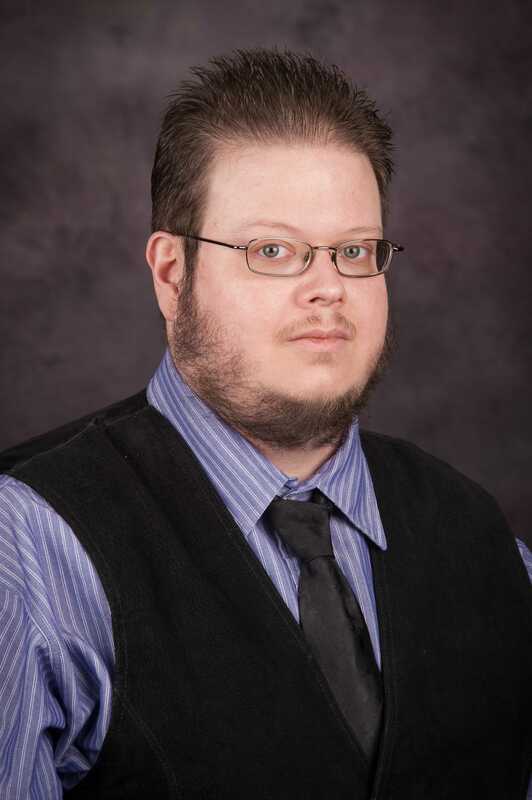 He joined K-State’s Information Technology Assistance Center (iTAC) in 2011 as a computer technician and advanced to Information Technology Coordinator with iTAC in 2016. Recently, he was named product owner for Office 365. 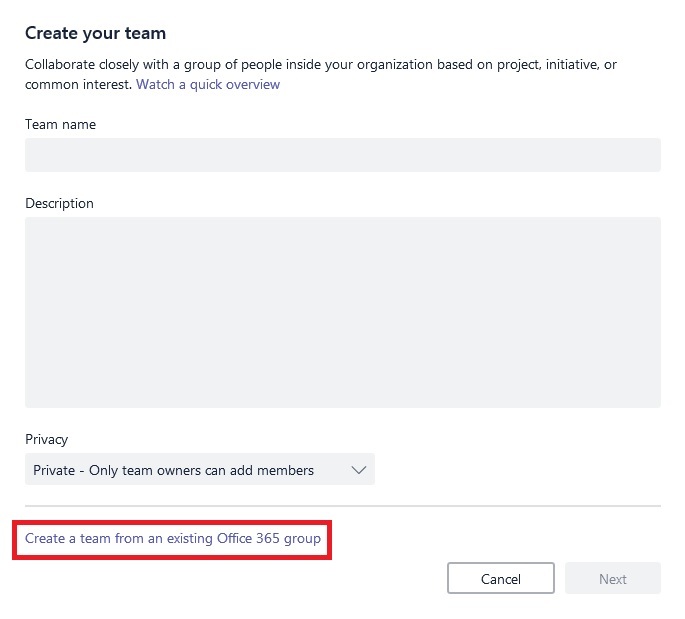 Discussion of "Collaborative Benefits of Office 365 Groups"
Version 17 id 1545252 of this page, updated 10 January 2018 by Shalin Hai-Jew. Created by Shalin Hai-Jew.